Thirty months after environmental groups sued to force ongoing seismic survey programs in the Gulf of Mexico to be subject to more robust compliance with the Marine Mammal Protection Act and Endangered Species Act, a settlement announced this week requires full EIS’s to be completed within thirty months from now. In the meantime, surveys will be kept out of three key biologically important areas, as well as from nearshore waters during the spring calving season of bottlenose dolphins. In addition, the oil and gas industry committed to continue working on alternatives that may affect sea life less widely, particularly vibroseismic techniques that would vibrate the seafloor directly (similar to a technique widely used for onshore oil and gas exploration), rather than via loud explosive sounds from airguns. And, the Bureau of Ocean Energy and Management will develop new standards to assure that airgun surveys are not unnecessarily duplicative. Dozens of surveys take place every year in the Gulf, with repeat surveys sometimes needed to assess reservoir depletion, and as new and improved imaging capabilities are developed; often, survey results are considered proprietary, especially prior to bidding on leases. 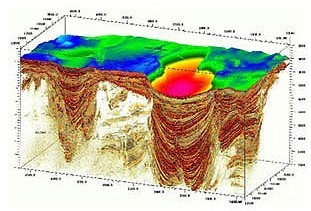 3D seismic imagery, above; airguns firing, below. Of particular concern are several populations of whales that are relatively few in number, and thus vulnerable to any disruption—in particular, the Gulf’s small population of sperm whales, whose nursery in Mississippi Canyon was ground zero for the spill. In 2009 an Interior Department study found that Gulf sperm whales subjected to even moderate amounts of airgun noise appeared to lose almost 20 percent of their foraging ability, which may help explain why the population hasn’t recovered from whaling. One of the new requirements that may not have been widely used in the Gulf is the employment of listening devices to help identify whales that may be nearby but unseen by observers scanning for surfacing whales. As with the controversy over Navy noise-making, much of the nitty gritty of the new EIS process will focus on subtle behavioral impacts, and the difficult question of how much such disruption is tolerable while maintaining the health of animal populations. A recent scoping hearing in Florida, marking the beginning of the long EIS development process in one zone of the Gulf, included some back and forth on this question. For a full list of the settlement requirements, see this CBD press release. Previous AEI coverage here and here. RELATED: Australian environmentalists are upset about seismic surveys OK’d in an area important to blue whales. According to an article in The Standard, “Government guidelines are clear that seismic surveys should avoid places and time of year when whales are highly likely to be present,” said Michael Collis of the International Fund for Animal Welfare. “We can’t think of a clearer example of this than Australia’s largest ever sighting of blue whales. People should view noise pollution the same way they view chemical pollution. The scientific community is slowly waking up to what a problem this is.” Collis said the fear was the giant mammals could be displaced from their feeding grounds, causing unknown repercussions, and knocked back suggestions that environmentalists opposed all off-shore gas mining exploration. “In Australia there are over 300 oil and gas reserves. 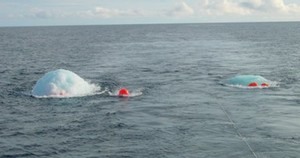 We are talking about five areas that are special to whales,” Mr Collis said.